Stands decorate the sides of the buildings along a lane in Old Quebec in Quebec City, Canada where artists display their work. Along the lanes in Old Quebec in Quebec City, Canada you will find many market stands where the artists sell their creations. You can buy the artists paintings or have some of them do a portrait of yourself or family members to take home with you. Artists at work along a lane in Old Quebec, Quebec City, Quebec, Canada. UNESCO World Heritage Site. 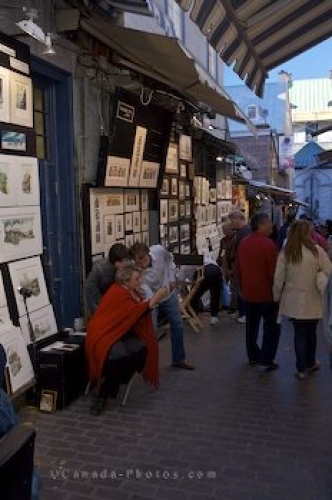 Picture of artists work in stands along the lane in Quebec City in Canada.